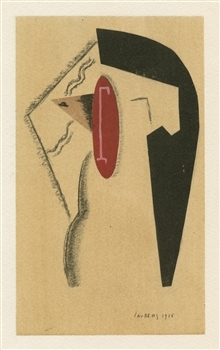 Henri Laurens pochoir "Tete de femme"
Medium: pochoir (after the watercolor and collage). Printed in Paris by the atelier of Daniel Jacomet, and published in 1955 by Heinz Berggruen for a rare catalogue. The image measures 5 1/2 x 3 1/4 inches (140 x 84 mm). Signed in the plate, not hand-signed.